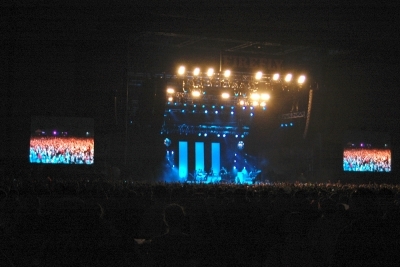 Friday was the first day of the inaugural Firefly Music Festival. 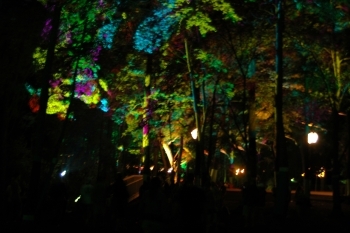 The festival is being held at The Woodlands which is an 87-acre tract of grassy areas between wooded tree lines across Route 1 from the Dover International Speedway in Delaware. This centrally locates it to many of the Mid-Atlantic's large cities including New York, Philadelphia, Baltimore and Washington, DC. There haven't been many multi-day festivals so easily accessible to fans along the East Coast. Firefly comes complete with on-site camping, “glamping” aka luxury or glamorous camping, and RV spots. Camping and hotels in the area are sold out. 3-day passes have been sold out for weeks and only single day passes for Sunday are still available at their website if anyone makes a daytrip out of it. Friday was a great day for a festival's initial run. It was the worst one on the weather forecast but the rain didn't do much damage on site, just a little bit of soft ground and mud, but nothing epic, and it didn't open up and pour on the crowd either. The rest of the weekend looks great, especially the temperatures. There are four stages set up so there's constant action with the headliner each night taking the main stage to themselves. Two of the stages are right next to each other, the other two are a walk to the other side and are back to back. There is also an arcade, balloon rides, a hammock hangout, beer and wine gardens, plenty of food vendors, free water refills, and of course cell phone charging stations. The schedule was light today with a late start and the crowds didn't start coming in until much later in the day, but of course it's a weekday. Here's a quick recap of what I was able to catch: OK GO put on an explosive set on The Lawn stage in the middle of the afternoon, with plenty of confetti cannons. I just want to see if the Flaming Lips can out do them on the cannons on Sunday. 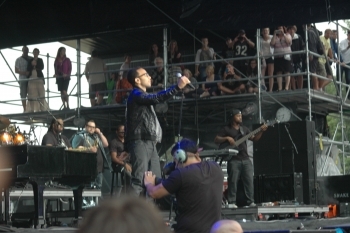 John Legend played the Firefly stage and drew quite a large crowd. He seemed a bit out of place on paper with the rest of the lineup when it first came out but he sounded great going through his canon (not confetti) of hits. After Legend, the choice was Bassnectar, bassheavy dubstep live dj, or Silversun Pickups. I have seen Bassnectar and he's an organ-rattling blast especially at a festival, but the thing about this layout is that I'd have the walk all the way around. 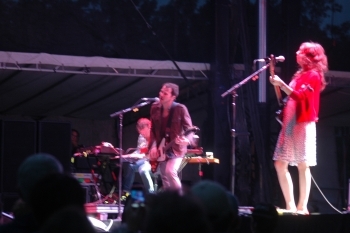 Silversun Pickups were straight ahead. They have a great energy that comes off of the stage, and not just from lead man Brian Aubert. Female Bassist Nikki Monninger is rock solid and is reminiscient of The Pixies' Kim Deal. Their sound as a whole has undertones of early 90's rock and grundge. 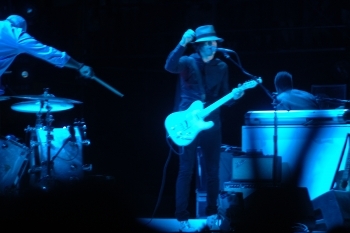 The big show of the night was reserved for Jack White. The stage was arranged and lit like an old Hollywood set. With minimal white can lighting, the band arranged tight, and two big flood lights pointing down over and behind them. He's touring solo now in support of his first solo album Blunderbuss. Despite supporting that album, he didn't just stick to that material, but dove into stuff from his past bands, playing plenty of material from the White Stripes for example. “Seven Nation Army”, “Hello Operator”, “Dead Leaves and the Dirty Ground” were just a few Stripes songs to get the crowd going. There's still 30 something more acts to come Saturday and Sunday. More to follow from Firefly.